Tapestry weave of dyed wool, undyed linen, plain (tabby) ground weave of undyed linen, L. 269.5 cm; W. 181.5 cm. Panopolis (Akhmim), Egypt, ca. Early 6th century CE. The Metropolitan Museum of Art, Gift of Edward S. Harkness, 1926 (26.9.8). The imagery on this tunic, which includes a number of Dionysian motifs that seem to refer to Dionysus's campaign through India, suggests that it may have been worn for banqueting or drinking parties. 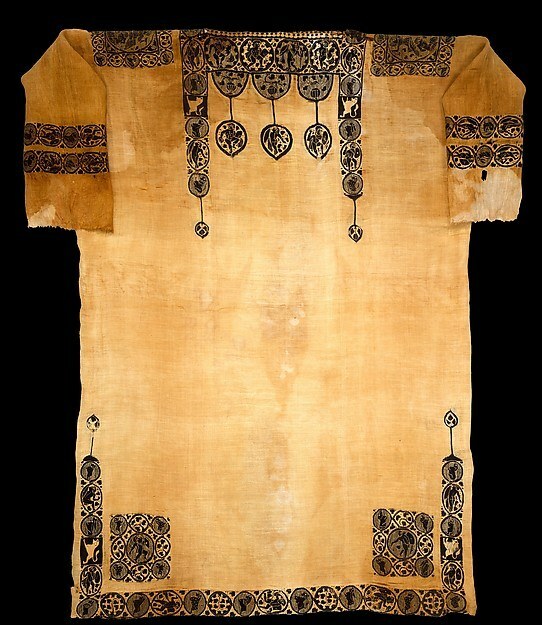 Furthermore, like most of the well-preserved garments of Late Antiquity, the staining of this tunic indicates reuse in a burial.